Parents in the U.S. are claiming the popular children's TV show Peppa Pig has caused their kids to start speaking in a British accent. 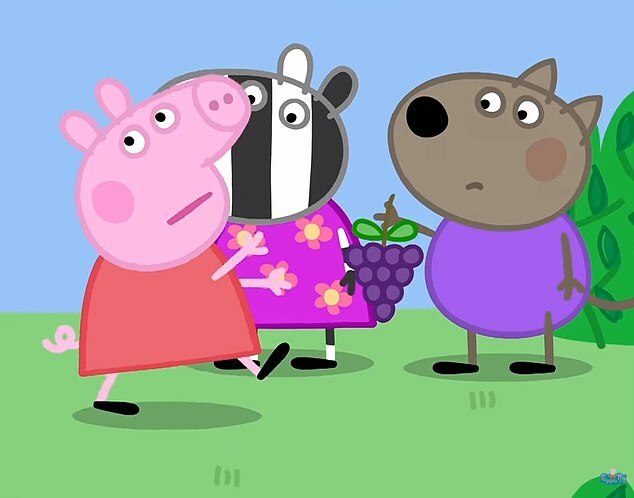 The cartoon follows the life of a pig, Peppa, and her family as they go about their day-to-day life in a fictional U.K. town made up of various animal families. And now parents of children who love the show are noticing that their kids are beginning to speak just like the characters in the cartoon. The animated series first aired in May 2004, and has since grown to become a popular TV show for young children. Kids all over the world are now tuning in to see Peppa's latest adventures, and it seems as though Peppa's southern British accent and vocabulary seem to be rubbing off on those watching the show. Dozens of parents have recently shared their concerns on Twitter, with many blaming the TV show for causing a change in the way their children are speaking. Twitter user @Supersly20 wrote: 'My 4 year baby girl loves watching Peppa Pig and I have noticed her accent and grammar is extraordinary. 'Last night I tucked her to sleep and she looks at me and says "daddy, can you snuggle me" I was like what did you just say baby girl? I don't remember the last time I used that word,' he added. 'I’d like to thank Peppa Pig for the slight yet adorable British accent my toddler is acquiring. #mum #mummy,' added user @jenrofe. A fourth user, @Steinbrennerjes, wrote: 'The most entertaining aspect of my life right now is that my toddler has been watching Peppa Pig and now speaks with a British accent. U.S. mother and writer Janet Manley dubbed it the 'Peppa effect'. In an article she wrote for Romper, Janet revealed that immediately after her daughter's first time watching the show two years ago, she started calling her 'mummy'. 'Two years later, she still oinks in conversation. Call it the Peppa effect,' Janet said. And the 'Peppa effect' isn't anything new. Parents have been tweeting about it for a number of years. Since the show first aired, there have been a total of 241 episodes created as the show surged in popularity.